It's not every day one gets a chance to rediscover the world. 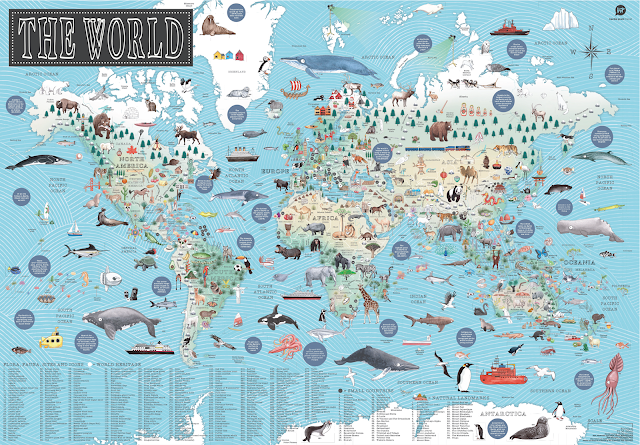 Now you can, in full glorious colour thanks to Tania McCartney's stunning new Illustrated World Map. For curious adventurers who never stop exploring, this stunning, large-format map is a modern take on exploring the world, from the highest mountain to the deepest surrounding sea. Wall maps are one of the latest trends when it comes to interior decorating, and now both adults and kids alike can adorn their walls with this beautifully illustrated map. Showcasing more than 300 individual illustrations of flora, fauna, landmarks and attractions from around the globe, intricate details could keep anyone enthralled for hours. Watercolour illustrations combine with digital art to create an eye-boggling journey, and a priceless resource for schools, libraries and organisations. Keep an eye out for this extremely collectable piece of literary decor in all good book and gift shops next month and stay tuned for our KBR review.